Breakfast Menu Served from 8:00 a.m. - 10:30 a.m. Lunch Menu Served from 11:00 a.m. - 4:00 p.m. 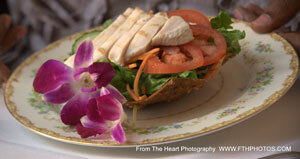 The Duke -- Fresh garden greens with your choice of chicken, egg or albacore tuna salad and choice of dressing. Afternoon Tea Selections Served from 11:00 a.m. to 4:00 p.m.